As you settle into your seat on a cross-country airline flight to yet another Emergency Medicine conference, you hear the familiar Hi-Low tone signaling an announcement. Suddenly a pressured, yet professional, voice booms overhead: “If there is a medical professional on board the aircraft, would you please contact a member of the cabin crew?” You pause for a moment and do a mental size up – what exactly would I be able to provide? Am I protected legally? What equipment is on board? The uncomfortable realization that you may be on your own – at 35,000 feet – quickly settles in as you unbuckle your seat belt and walk to the nearby galley. Medical professionals such as EMS providers and physicians have always been aware that they may be called upon to respond as Good Samaritans in the event of an off-duty emergency. Aviation in-flight medical emergencies are uncommon events, with estimates ranging widely from 1 event every 40 flights to 604 flights or up to 10-40 events every 100,000 passengers [1-3]. The variation in estimates are due to the lack of a central registry with most studies relying on proprietary company data from either the airlines or a ground-based aeromedical consultation service. Common in-flight medical events include syncope/near-syncope, GI complaints, respiratory problems and cardiovascular emergencies. Cardiac arrest is rare, with one review showing it represented only 0.3% of all inflight medical events . An individual shall not be liable for damages in any action brought in a Federal or State court arising out of the acts or omissions of the individual in providing or attempting to provide assistance in the case of an in-flight medical emergency unless the individual, while rendering such assistance, is guilty of gross negligence or willful misconduct . The same law also updated required equipment on board commercial civil aviation aircraft in the United States. A scheduled air carrier – which the FAA calls a Part 121 Operator – is what most passengers fly in the United States. 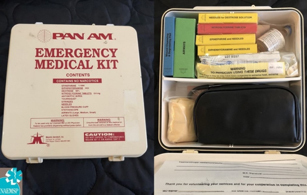 If a Part 121 aircraft has at least one flight attendant on board, the aircraft is required to have an Emergency Medical Kit (EMK), Automated External Defibrillator (AED), general first aid kit, bloodborne pathogen spill equipment and oxygen for first aid (if the aircraft operates above 10,000 feet) . All Part 121 cabin crew in the United States are required to receive first aid and CPR/AED training, with demonstration of CPR/AED skills every 2 years, in addition to being familiar with the location of equipment on board the aircraft . However, cabin crew education on obtaining vital signs or performing a physical exam is not required by regulations. Each airline dictates their own policy on identifying potential medical volunteers and may request professional identification. Some international airlines – such as Japan Airlines, Lufthansa, SWISS and Austrian Airlines – maintain a registry of physician passengers who can be called on to render assistance if needed [8,9]. Medical volunteers, such as physicians who choose to respond should not have consumed alcohol prior to rendering care or otherwise be impaired . Many airlines across the globe are contracted with an aeromedical ground support service, such as MedLink (located in Arizona) or Stat-MD (located in Pennsylvania) that provides physician consultation and helps the flight crew determine if diversion is necessary and assists cabin crew and volunteers with passenger medical care. They also perform ground based medical evaluations of patients if there is a concern that arises as to whether the patient is medically suitable to fly on a commercial flight. The ultimate decision for diversion rests with the pilot-in-command who will use the ground-based physician service and possibly inflight medical volunteers to assist in making the decision. Diversion is very costly and airlines attempt to avoid medically unnecessary diversions. Given the unique considerations of the aeromedical setting, suitable airports and local available services, medical volunteers should defer to the recommendations of the ground physician. Communication with the ground physician may take place with in-cabin headsets, telemedicine equipment or relayed through the flight deck. Some airlines – particularly those flying long-haul routes – have also elected to equip their aircraft with patient monitors that integrate voice communication, video, EKG, pulse oximetry, temperature and other parameters that can be transmitted to the ground physician, though these are rare to find on domestic US operations . Airlines will ask that volunteer help complete documentation for care that is rendered. The only FAA required vital signs equipment in an EMK is a stethoscope and blood pressure cuff. 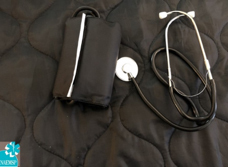 Auscultation of breath sounds and blood pressure can be challenging due to engine noise and vibration. As such, blood pressures may need to be palpated. Pulse oximeters, while not required by regulations, are sometimes added to EMKs, although providers should be aware that the effects of altitude may cause normal changes in oxygen saturation. While oxygen saturation at sea level is approximately 97%, decreased oxygen tension at altitude will reduce this saturation value. Most civilian airlines are pressurized to maintain a cabin altitude of approximately of 6,000 to 8,000 feet: at 8,000 feet a normal oxygen saturation will be approximately 93% . 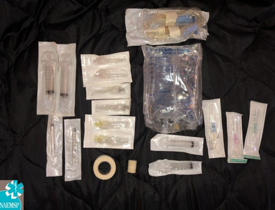 The EMK is required to stock a limited amount of parental medication equipment and includes one IV tubing set with Y-connectors, 500cc of normal saline, 5cc and 10 cc syringes in addition to medication needles. As many EMKs utilize vial or ampoule epinephrine instead of an epinephrine autoinjector, 1cc syringes are also included. Curiously, the FAA did not specify the type or quantity of intravenous catheters to be equipped, thus leaving the decision up to the airlines or their EMK vendor. The author has seen as few as two 16-gauge IV catheters to a more generous set of one 18, 20 and 22 gauge IV catheters. Basic airway adjuncts are included in the kit and at a minimum must include a bag-valve resuscitator (regulations do not specify what size), 3 sizes of oral airways and masks (pediatric, small adult, large adult) and CPR masks of equivalent sizes. The EMK presented above met these requirements by providing three mask sizes that could be either used with the adult bag mask resuscitator or a one-way CPR valve. Oddly, there is no requirement for the equipped bag-valve resuscitator to have oxygen tubing that is compatible with the aircraft portable oxygen bottle outlets. Portable aircraft oxygen bottles, unlike those found in medical settings, are generally equipped with only two settings, low (2 liters per minute) and high (4 liters per minute). For these types of bottles, applying the mask adapter into the appropriate rate connection outlet will determine the flow rate. A bronchodilator is also required as part of the EMK. A spacer, which is not required to be equipped, may need to be improvised using a toilet paper roll, rolled-up magazine or plastic bottle when treating children . Based on previous literature, near-syncope and syncope comprise the majority of inflight medical emergencies. This condition, although frightening to the crew and other passengers, rarely requires IV administration or diversion. Simple maneuvers such as laying the patient supine, with legs elevated and applying oxygen, for the most part, are all that is required [2,4]. Antiemetics are not required to be equipped in the EMK despite nausea and vomiting being a common inflight medical event. Although carrying antiemetics while traveling is advisable, it should be noted that serotonin receptor antagonists, such as ondansetron, are not effective for motion sickness . Alternatively, the EMK does carry diphenhydramine which can be used off-label as an antiemetic. It is also reasonable to request if other passengers may be carrying over the counter antiemetic medications. The EMK provides four 325mg of aspirin and at least 10 tablets of nitroglycerin. There is no requirement to include a single or 3-lead EKG as part of the equipment, though some airlines include this as a stand-alone device or optional attachment to the on-board AED . In addition to the on-board Automated External Defibrillator, the EMK provides two doses each of 1mg atropine and 1mg epinephrine. A total of 200 mg of lidocaine is also required. Despite the provision of antiarrhythmics, there is no requirement for airlines to ensure that the equipped AED has a screen that permits the user to see the underlying cardiac rhythm. Due to space constraints within the cabin, patients in cardiac arrest may need to be moved or dragged to the galley or a bulkhead row to ensure enough space is provided to render effective CPR. Ending resuscitation can be challenging and consultation with the ground physician is advisable. Diphenhydramine in both oral and injectable forms are provided in the EMK, with four 25mg tablets and two 50mg vials. Two ampoules of epinephrine 1mg/mL (1:1000) must also be equipped. Some airlines have included epinephrine autoinjectors as part of their EMKs, but this is not required by regulations. 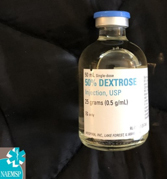 A total of 25 grams of injectable dextrose is equipped in the EMK, though there is no requirement for a glucometer or lancets. If a glucometer is needed, one option is to ask the cabin crew to make a public address announcement to see if another passenger may be willing to volunteer a personal one. An alternative is to assume the blood sugar is low (particularly in a syncopal event) and to provide an oral dextrose source such as orange juice if the passenger is able to drink. The EMK was primarily designed for adult medical emergencies and lacks pediatric appropriate supplies and equipment. In 2018, the FAA Reauthorization Bill was passed which included verbiage from the Airplane Kids in Transit Safety Act and directed the FAA to revise the EMK to meet the needs of children . The FAA has yet to provide guidance in response to this bill. Internationally, wide variations exist for on-board medical equipment. In Canada, an AED is not required by regulations and an EMK is only required on civil aircraft carrying more than 100 passengers [17, 18]. In Europe, defibrillators are not required, although are recommended if an aircraft has 30 or more passengers with at least one member of cabin crew . One 2014 paper found that many German airlines did not carry AEDs and one carrier did not have any CPR equipment on board . 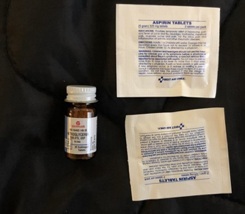 In contrast, some airlines on their own initiative, such as British Airways, far exceed these requirements, carrying an extensive array of medications and equipment including benzodiazepines, buprenorphine, antibiotics and suture equipment . These optional enhancements have led to several remarkable stories of innovation and improvisation, including a 1995 case in which a physician volunteer improvised a chest tube for a passenger suffering from a tension pneumothorax using a urinary catheter found in the British Airways medical kit . Epstein, Catherine R, et al. “Frequency and Clinical Spectrum of in-Flight Medical Incidents during Domestic and International Flights.” Anaesthesia and Intensive Care, vol. 47, no. 1, 13 Feb. 2019, pp. 16–22., doi:10.1177/0310057x18811748. Kesapli, Mustafa, et al. “Inflight Emergencies During Eurasian Flights.” Journal of Travel Medicine, vol. 22, no. 6, 2015, pp. 361–367., doi:10.1111/jtm.12230. U.S. G.P.O. Public Law 105 - 170 - Aviation Medical Assistance Act of 1998 (1998) (enacted). Gradwell, D., & Rainford, D. (2016). Hypoxia and hyperventilation. In Ernsting's Aviation and Space Medicine 5E (pp. 55-56). Boca Raton, FL: CRC Press. Gradwell, D., & Rainford, D. (2016).Motion Sickness. In Ernsting's Aviation and Space Medicine 5E (pp. 794-795). Boca Raton, FL: CRC Press.